CALL OR EMAIL TO SCHEDULE, TODAY! Jaymie brings a wealth of knowledge to the home inspection industry. With a Master’s Degree in Communication and almost 20 years of experience working in the architectural design industry, she quickly puts her clients at ease with the inspection process. Jaymie is a graduate of the House Call Training Institute and has been licensed with House Call since 2010, and has since performed over 2,000 home inspections. She is a certified wood destroying insect inspector with the state of Indiana, and is a full member of the International Association of Home Inspectors (interNACHI). Let Jaymie help take the hassle out of the home buying experience. At House Call we perform a professional visual examination of the condition of a home. In today’s market, a home inspection is performed to gain valuable information in a real estate transaction. We are especially passionate about educating and empowering our clients, with knowledge about the function of their home. We do our very best to uncover any major defects or potential safety issues prior to a listing or purchase. 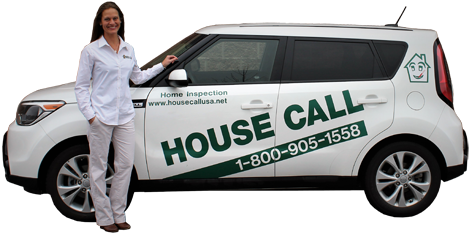 House Call Home Inspections are usually performed after a sales contract is entered between the buyer and seller. The home buyer, seller, and Realtor is encouraged to attend the inspection. We want all parties to be educated on the home. Most home inspections take 2 to 3 hours. Reports are typically emailed the same day, and a full color report is printed in a binder upon request. Our inspection reports highlight features of the home. House Call home inspectors help remove home buyer nerves, through educating and empowering our clients through the home purchasing process. And after your purchase, we encourage you to keep in touch with ongoing home maintenance questions. Would you like to know more about our services? We are ready to answer any questions you have. Call or email to schedule, today! Prices based upon Total Square Footage, including any walkable basement areas, and are subject to change. Additional charges may apply for multiple unit properties, HVAC units or electric panels, and large out-buildings such as barns or pool houses. Please call us to verify pricing.